The Vancouver Giants added some veteran skill to their lineup, announcing the acquisition of overage forward Brad Morrison from the Prince George Cougars Friday afternoon. In exchange, the Giants send a conditional second-round pick in the 2018 WHL Bantam Draft to Prince George. 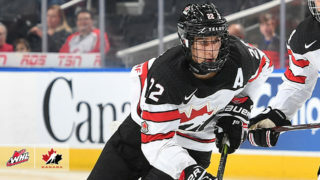 Morrison, a product of Prince George, was originally a first-round selection (seventh overall) of his hometown Cougars at the 2012 WHL Bantam Draft. 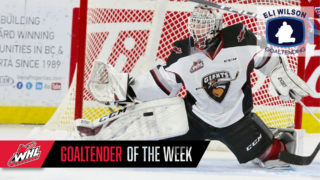 Over 260 career WHL regular season games with the Cougars, the 6-foot, 170-pound centre amassed 188 points (85G-103A) and added another 11 points (3G-8A) in 11 playoff outings. 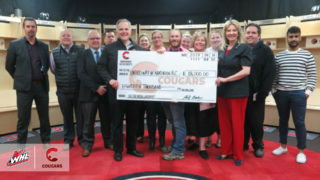 “We want to thank Brad for contributing to the Prince George Cougars success over the past four seasons,” said Todd Harkins, general manager of the Cougars. “He played a huge part in helping us make the playoffs in each of the past three seasons and gaining a B.C. Division title. 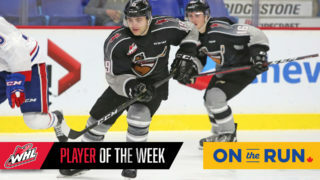 Morrison had the opportunity to represent Team WHL this past season, suiting up for the annual CIBC Canada Russia Series in his hometown of Prince George. He was selected by the NHL’s New York Rangers in the fourth round (113th) of the 2015 NHL Draft, but went unsigned. The pivot hit career marks in 2015-16, tallying 62 points (28G-34A) in 72 games. His totals dropped ever so slightly in 2016-17 as he managed 52 points (21G-31A) in 61 games with the B.C. Division’s regular season champion Cougars. Heading into the off-season, the Cougars faced a logjam within their 1997 age group. After the trade of Morrison, the club still has 11 players eligible to return for the 2017-18 campaign. While forwards Jansen Harkins (Winnipeg Jets) and Jesse Gabrielle (Boston Bruins) along with defenceman Brendan Guhle (Buffalo Sabres) are all under NHL contract, eight players still remain, including forwards Brogan O’Brien, Jared Bethune, Aaron Boyd, Radovan Bondra and Tanner Wishnowski, defencemen Shane Collins and Tate Olson, as well as goaltender Nick McBride. As for the Giants, their group of eligible 1997-born returners is more manageable with six potential overagers in the fold. Forwards Ty Ronning, Jack Flaman, Johnny Wesley and Morrison join defencemen Jordan Wharrie and Darian Skeoch as potential 20-year-olds on the roster. 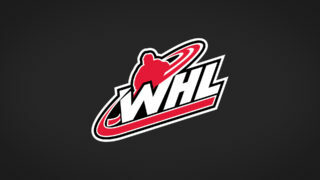 WHL clubs are permitted to carry a maximum of three overage players on the active roster. The overage shuffle is in full swing as the off-season opens, with three 20-year-old goaltenders moved in recent weeks, including Travis Child (Brandon Wheat Kings to Edmonton Oil Kings), Mario Petit (Everett Silvertips to Kootenay ICE) and Nick Schneider (Medicine Hat Tigers to Calgary Hitmen) all on the move. Overage forward Matt Bradley was also shipped from Medicine Hat to Regina earlier in the offseason.